Buster Poindexter poses the question in his song “How you feelin’ ?” Hot Hot Hot has to be the reply and we can relate to that here in Joburg over the last few weeks with this extreme heat. We are all ‘glowing’ in this heat and it has been a challenge to say the least to firstly muster up the energy to be creative and then to try and protect my cupcakes and their sugar art decorations from wilting! What is the first thing that comes to mind when you think of summer and extreme heat – okay well what do you think of after sipping strawberry daquiris in the jacuzzi? You guessed it …. ice-cream! I used a cutter to cut out these ice-cream cones from white sugar paste and then added the cone cut outs from brown sugar paste. I painted some tylose onto the tips of the cones and sprinkled them with the most well known of all cake decorations – hundreds and thousands – I hadn’t thought I would be using them in a hurry again! 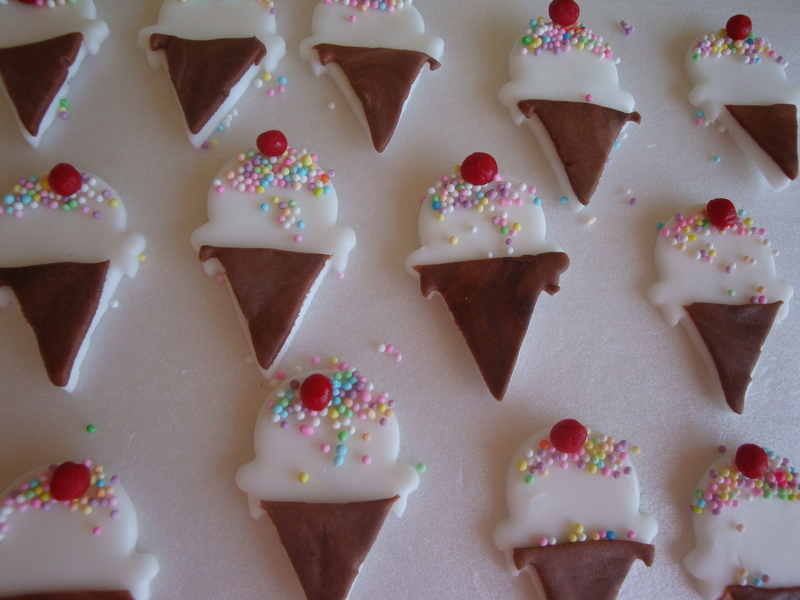 And then for the cherry on the top I rolled small balls of red sugar paste and added them to the ice-cream cones. 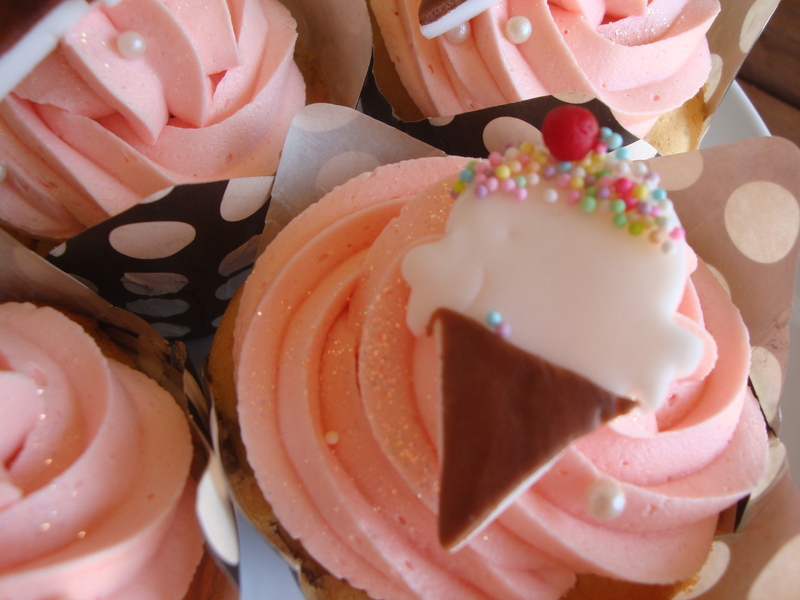 I made vanilla cupcakes (note to self – you need to have an original ice-cream flavour cupcake for these next time) and iced them with a gorgeous strawberry icing and added my cute ice-cream cones to the cupcakes. I think you’ll agree that both the cones and the cupcakes turned out simply Lickable! Thanks and you were right about the rain! If it carries on for a while I might have to think up some ‘rainy day’cupcakes! Another “cool” idea! Well done – they certainly look very refreshing. Thanks Tracy, I know the girls love the strawberry icing but there were none left of my extras after Teigh devoured them! Do you think he would eat the last rolo in the pack – maybe not if Paige was sitting next to him!